See your doctor or sports physiotherapist for further advice. You may be prescribed anti-inflammatory medicine and a rehabilitation programme. Sometimes, the ankle may be put into a walking boot or cast to immobilise the ankle in the short term. Gentle calf stretching is the first stage of rehabilitation. Don?t stretch to the point of pain. 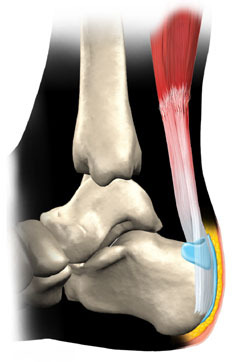 Strengthening the Achilles tendon is the second stage. Your doctor or sports physiotherapist will be able to advise you on exercises for this. Special exercises called eccentric calf raises, that contract the calf muscle as it is lengthening (during the lowering part of the movement), are the standard exercise used in the rehabilitation of Achilles tendon injuries. Sometimes a heel raise or orthotics may be useful. As symptoms resolve, resume normal weight-bearing activities gradually. Avoid running until all tenderness has gone. Swimming or cycling in low gear are good replacement activities.